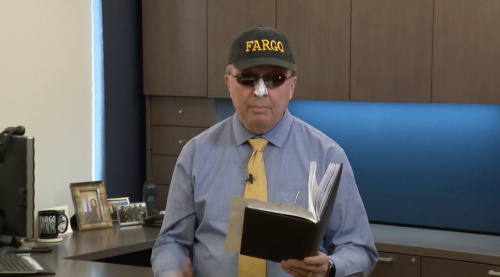 FARGO – Weeks after a mayoral proclamation announcing February as “Fridguary,” Mayor Tim Mahoney traveled 50 miles south over the weekend, and was amazed at the amount of snow waiting to melt. “The people no longer say North Dakota is flat, thanks to the Fargo snow mountains,” Mahoney said in the comedic proclamation declaring February as Fridguary. Although Mahoney's proclamation was comedic, the possible flood situation in the Red River Valley and beyond is not, officials said. In town many roads are mostly dry and no longer slippery. Sidewalks can be icy in the morning as the melts freeze each night, which is slowing the waters flow into the Red River and its tributaries. Is preparing one million sandbags overkill? In 2009, a major flood event was categorized at five percent. This year, the chances of a flood reaching 40.3 feet is currently still at 10 percent. 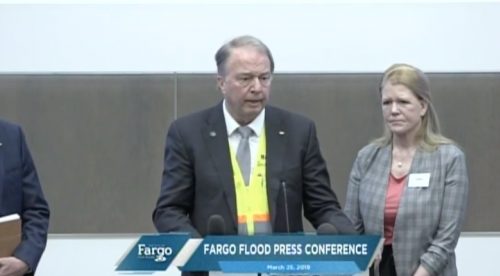 In 2009, Fargo had 10 days to prepare; this year the city has up to three weeks, Mahoney said. In the county, the Cheyenne River area is where widespread overland flooding may occur at heights to rival the 2009 flood. Rescue equipment, airboats, and other types of flood-fighting equipment are at the Cass County Sheriff’s Department’s disposal, Scherling said. “In our subsequent meetings you will see reports as we get closer to the flood crest,” Mahoney said. “Flood of 2009 we had rain, snow, sleet, we had every element of weather that got into that. 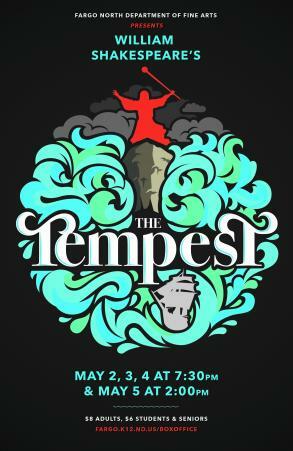 Two hundred volunteers are need at all times to work in shifts every weekday next week starting on Tuesday, March 26 at 7 a.m. at Fargo Sandbag Central, 2301 Eighth Avenue North. Those interested should register at www.FargoND.gov/FloodVolunteers. Students at schools, such as Ben Franklin Middle School 8th graders, are already scheduled in to produce sandbags next week.